The smell of fire permeates the air as we get closer to the campsite. 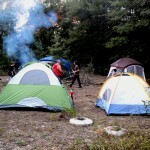 Satoshi Forest is nine acres, but only a small portion is used for camping. 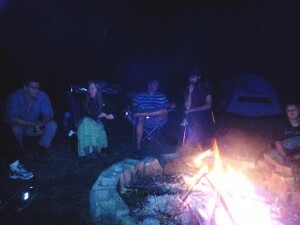 The community feel of the Forest is reinforced as Adam, Bob, John, Ian, and two young boys gather fire wood; my husband and I join them in the hunt. 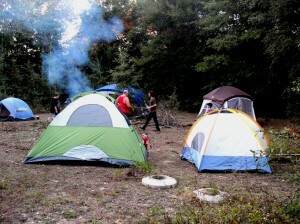 Though the camping area is modest, there is plenty of space to explore and find fuel for the fire. 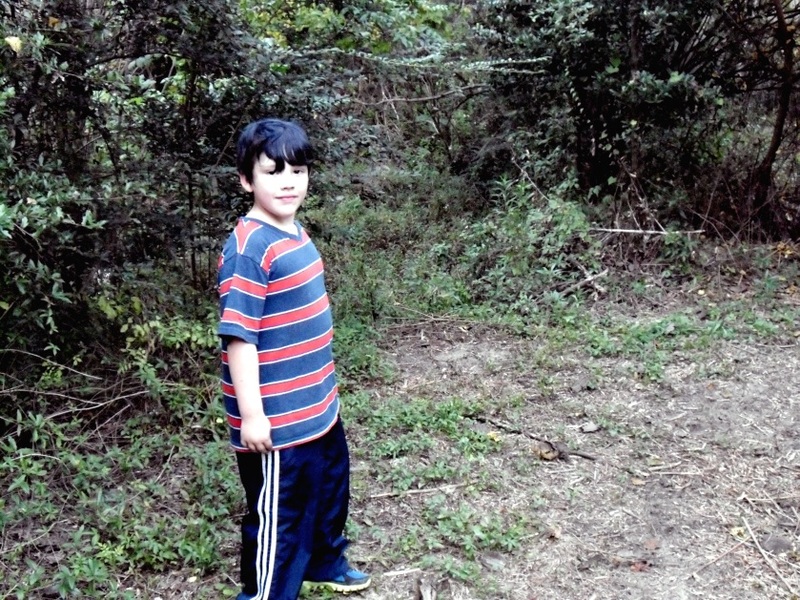 The multiple paths carved out by humans and animals make for interesting mini-adventures, and when one of the boys, Ignatious, suggested we check out the swamp, I was more than happy to oblige. Bob Wingerter and John Love gather wood near tents in Satoshi Forest. 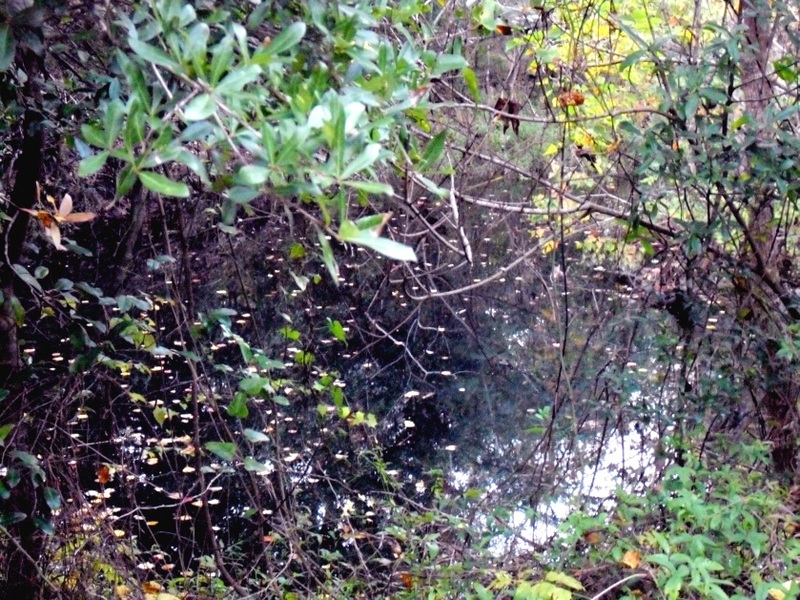 If you venture farther into the Forest, you can see the larger lake that feeds the swamp, and this is an integral part of Jason King’s vision for the land. By combining permaculture, food forests, and aquaponics, Satoshi Forest will not only be a sanctuary for the homeless where they can sleep undisturbed from local authoritarian figures, but a self-sustaining ecosystem that provides food to feed those in need. Because of the low impact style of food forests, the upkeep is optimized and food output high once it gets growing. I had until recently been unaware that a property existed in Pensacola in such a unique location; it is centrally located yet conveniently secluded. You can be driving on an average busy road one minute and the next minute, you are entering a path winding through trees and ending at the beginning of fairly densely wooded areas. You really feel off the beaten path as you go deeper into the Forest, yet are minutes away from “civilization” (as some would contrast the rustic existence with an artificially lighted one). 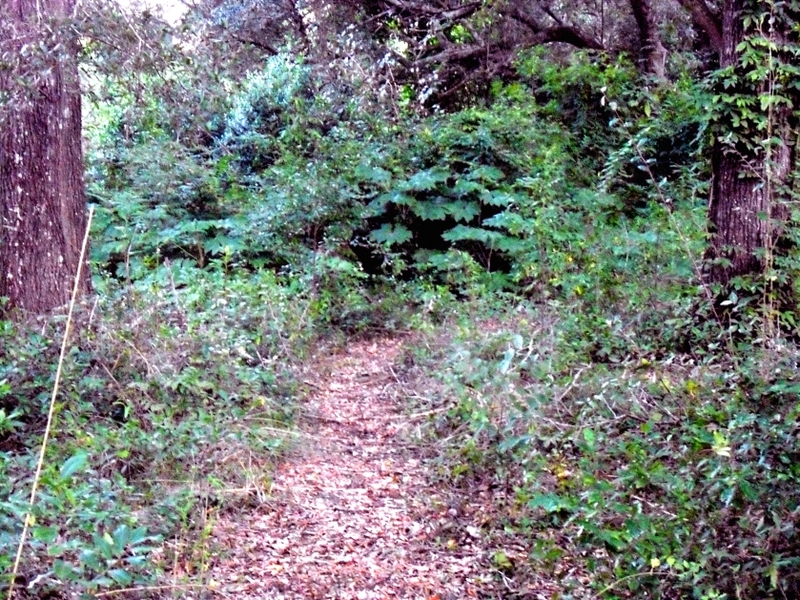 One of the paths leading into the Forest. 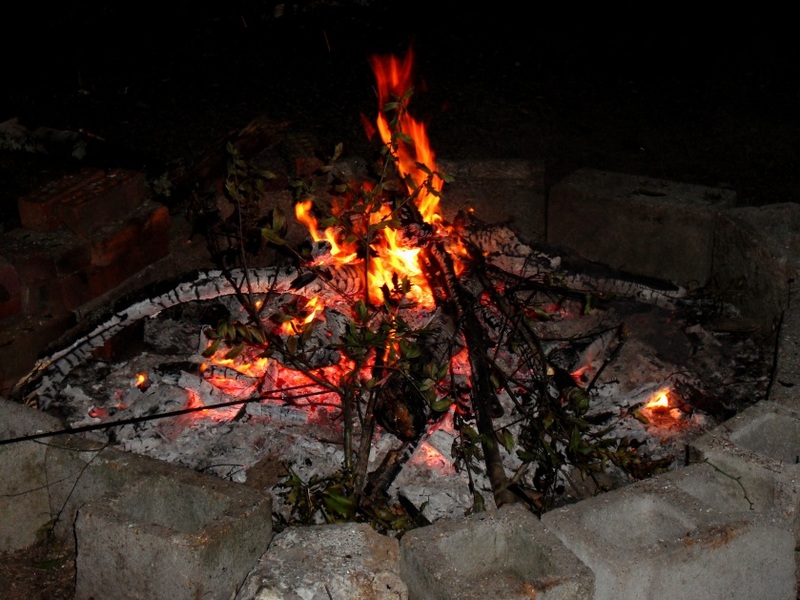 Having gathered and chopped more fire wood, it wasn’t long before the familiar pops of beer cans and smell of hot dogs saturated the atmosphere. While the boys innocently fought with sticks, the adults discussed weightier matters. 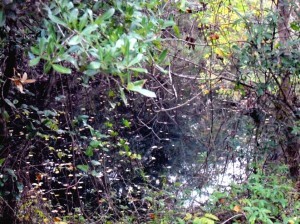 The swamp is fed by a larger body of water deeper in the property. A thought provoking point John made was how many more young people are on the streets in large cities compared to Pensacola. Florida in general is often referred to as a place where people go to die, a bitter allusion to its large elderly population. Pensacola is no different, and we see a lot of older homeless, many of which are veterans. Younger people typically move away from Pensacola because of its somewhat limited economic benefits. I was struck by the thought of so many young people left on their own to survive, many of whom were rejected by their parents over their sexual preference. Satoshi Forest is in its beginning stages, but hopefully one of many sanctuaries where ostracized youth can seek safety and self-sufficiency. 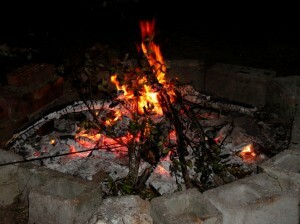 More branches and logs were added to the fire and the conversation changed to music. 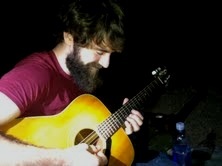 We had brought a djembe and guitar and it turns out John Love had a ukulele. 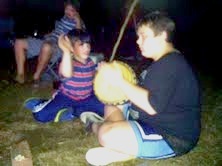 The young boys got to the djembe first, though, and adorably tried to play it at the same time. It was used to abuse, so we let them have at it for a bit while the guitar and djembe were tuned. When they were tuned we decided to relieve the young’uns of their djembe duty and jammed out for a bit. 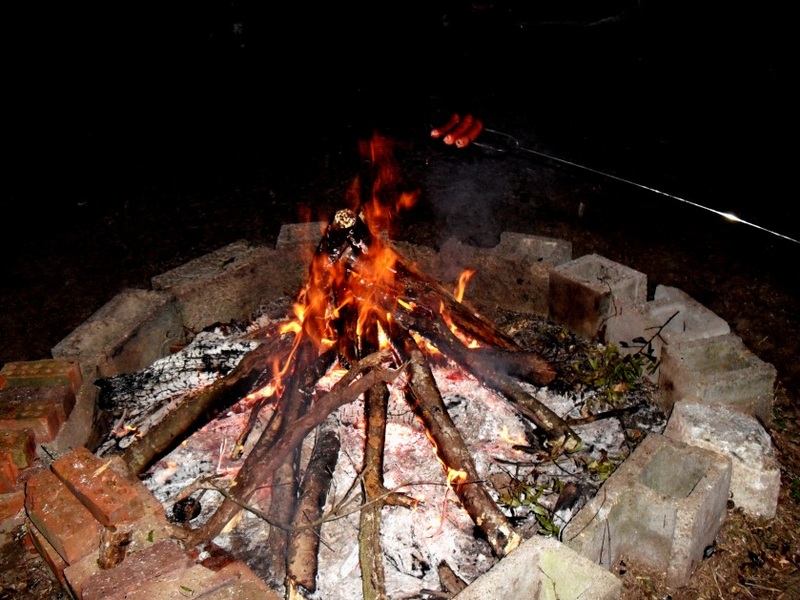 I have a hard time thinking of something more delightful than good company, good conversations, good music, and cooking over a fire. Another activist, Bob Wingerter, reflected on how Bitcoin has helped expand the scope of feeding the homeless in Pensacola. Bob does homeless outreach with Helping Hands, and has been able to increase the amount of days he can feed the homeless because of the amount of donations from Bitcoin. He’s not a techie, and admits he doesn’t completely grasp how Bitcoin works, but is very supportive of the cryptocurrency because he has directly seen the benefits in its ability to help feed and house the homeless. Satoshi Forest will close the gap between converting Bitcoin to cash to pay for food as the land will allow food to be grown and harvested directly by activists who feed the homeless; Bob was excited about this prospect as buying food from a store can get expensive as inflation raises prices. Through Helping Hands and Sean’s Outpost, Bob is active five days out of the week and sometimes more as the population of displaced people grows. 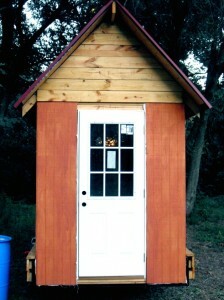 An example of the small houses built by Sean’s Outpost and the homeless. We have seen the Panhandling Ordinance attempt to hide the problem by making it illegal, but it hasn’t stopped the obvious growth of homeless as Pensacola fails to recover from the recession and oil spill. 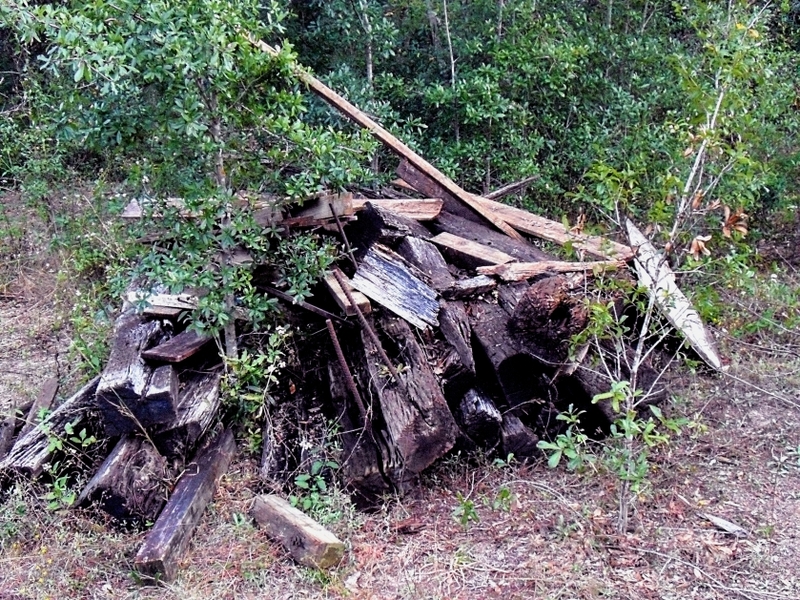 Escambia County is the poorest county in Florida, we have the lowest water quality in the country, and abandoned buildings litter certain areas like the West side of Pensacola. Before the homeless had to go into hiding, you could very clearly see the gradual increase on a monthly basis. More and more individuals and even more tragic, families, were out on the streets begging for work or spare change. The growth was exponential and exacerbated by inadequate payouts from the BP oil spill in 2010; there were people getting $30,000 checks working at places that weren’t affected and others who were directly damaged having to shut down because they were denied after jumping through bureaucratic hoops. There is a case to be made about the inefficacy of government in enforcing any kind of restitution to victims of corporate recklessness and the effect it has had on the homeless population locally. In a city where many live paycheck to paycheck, it’s still a long road to recovery after the disaster. Many transients travel here in the colder months because of the warmer climate, but winters still are brutal as the humidity levels create a unique and penetrating “wet-cold.” The beginning stages of coldness arose on that night, and though we were kept warm by the fire, I knew I could be home in about fifteen or twenty minutes if it got too cold. Others are not as fortunate, and that weighed heavily on my mind as we discussed the role of the Forest and cryptocurrency in combating the growing problem of the homeless. The thrill of that night was its simplicity, and the future of Satoshi Forest is a stellar one. I asked Jason how Satoshi Forest came to be and if he had the concept in mind for some time, and his answer was an excellent example of spontaneous order. The reality of the Forest came about “serendipitously,” as described by Jason, and very abruptly. It wasn’t something that he had really planned on doing; initially he was hoping to be able to buy a small building in which to pay the homeless to build their own homes, but the generosity of the Bitcoin community was overwhelming. Unexpectedly, he ended up finding someone to accept Bitcoin for payment of the land and partnered with the former gardener for the Manna Food Bank. It is still in the beginning stages and more alluring than the idea of where the Forest is now is the concept of where the Forest is heading. Satoshi Forest is more than just a place for people to camp and grow their own food; it is the answer to the question, “Who will feed the poor?” The people voluntarily participating in the counter economy and Bitcoin-fueled markets have already proven how effective mutual aid combined with direct action is, and you’re not going to convince the thousands of homeless fed by Sean’s Outpost, Food Not Bombs, and Helping Hands that Bitcoin is some flash in the pan “Ponzi” scheme. The Forest is the first community of its kind in the region, and as the idea spreads hopefully we will see more crypto-forests popping up. As the state proves over and over again it is woefully underprepared to deal with the problems it has sometimes had a role in creating, it is up to us to be more self-sufficient and help each other. The blossoming of the Forest is happening in real time, and is a poignant process to behold. I look forward to providing more updates as new developments take place, and this past weekend was only the beginning of what I hope will be a long lasting, autonomous community in a region that is in dire need of a new trajectory. *Thank you to John Love for suggesting edits to this section for accuracy and clarity. One pile of firewood gathered by campers. 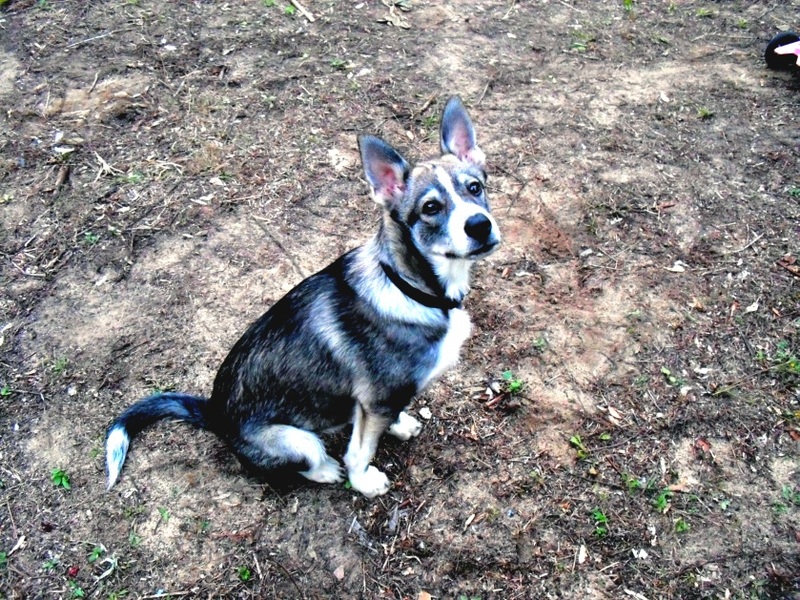 Ignatious leads the way deeper into the Forest. 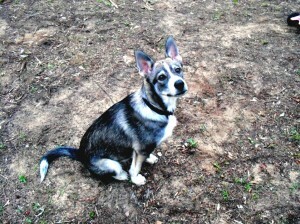 Boris, the wolf dog, kept us in check and made sure no dropped food went to waste. Jamming out on the djembe. Hot dogs roasting over an open fire.